Some days require advance planning, much organization and a roadmap to see you through. This weekend we had a house guest and while it was fun checking out our city through the eyes of a tourist and sharing our home with a new friend, it still required work. Work to search out recipes, work to grocery shop, work to prepare brunches and dinners. On Sunday evening, when all the hustle and bustle was over, Cornelius and I poured ourselves into flannel coziness and put on a tv-on-dvd guilty pleasure . 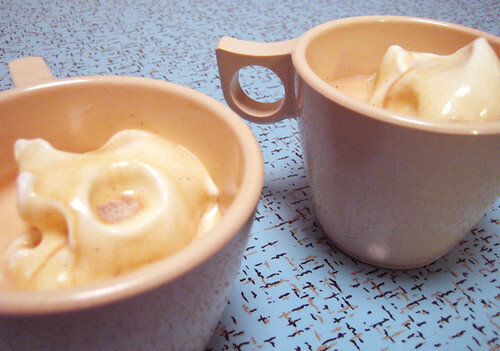 We also put our new Bialetti stovetop espresso maker to work and made the simplest, most decadent dessert imaginable: espresso ice-cream cups. Believe me, there is no roadmap or recipe needed here. A few years ago on a visit to my favorite city, Portland, OR, I stumbled into the Pied Cow Coffeehouse and had something called a “black velvet” or a “velvet glove”. The name never stuck, but the memory of that dessert always did. When I’d tell my friends about how glorious it was, I had already re-named the dish into the title of my favorite Daniel Clowes graphic novel, “Like a Velvet Glove Cast in Iron “. I would enjoy every spoonful and slurp and once the experience was over, I wanted to repeat it again and again. It was simplicity at it’s best. A study in contrast. A scoop or two of vanilla ice-cream in your favorite pint glass or mug and a shot or two of hot espresso poured over top. That’s it, there you have it. It’s the perfect stress-free way to end a fancy dinner party with friends or the best way to unwind with your loved one afterwards. Wow, easy and delicious. That’s my kind of dessert! Hah- I just looked up your guilty pleasure. I’d never heard of it, but I grew up in SLC and knew a polygamist family. Funny stuff. Sounds lovely and I am not even a big coffee lover. And there is no shame in Big Love. Not having cable and being unable to watch season two is killing me. The photo of your creamy dessert looks so dreamy…but being the boring person that i am – I don’t drink coffee – at all…however, I’d definitely be willing to make this for guests if the opportunity arose. Purrl was right, affogato – delicious. And what always amazes me is that even if it’s not absolutely top draw, really special, you can see the specks of vanilla, buy it on a special occaision ice-cream it’s still gorgeous. purrrl, i never knew it had an official name. affogato, i love it! thanks. joanne, big love is great! it’s got the perfect mix of humour, drama and creepiness. le laquet, i think this dessert can be played with. i love the lemon sorbet and grappa idea! Yum, definitely bookmarking this. I’ll take two, please! jenn, it totally is divine. yum. you know what would make this even better? chucking on a couple of dark chocolate coated coffee beans 🙂 nom nom nom.